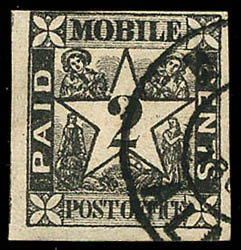 Confederacy, Mobile, Ala., 1861, 2¢ black, three large margins showing part of adjacent stamp at left, clear to just touched at top, intense color and impression, bold double-circle Mobile cds, Very Fine appearance. 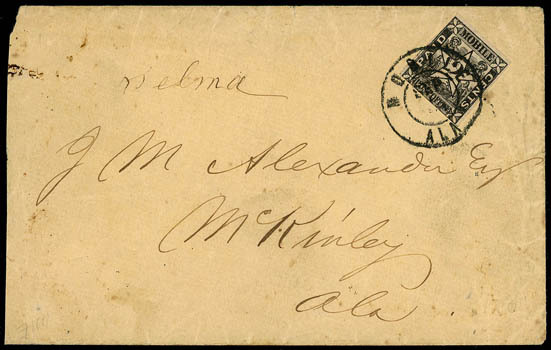 Confederacy, Mobile, Ala., 1861, 2¢ black, just in at bottom otherwise mostly large margins, tied by "Mobile, Ala./Sep 1, 1861 " double circle postmark on cover to McKinley, Ala.; reduced somewhat at left, F.-V.F. ; with 2007 C.S.A. certificate. A VERY RARE 2¢ MOBILE PROVISIONAL USAGE PAYING THE 2¢ CIRCULAR RATE, RATHER THAN THE USUAL 2¢ DROP RATE. 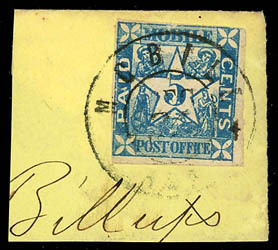 Confederacy, Mobile, Ala., 1861, 5¢ blue, large margins to barely touched at top, tied by Mobile cds on small yellow piece, tiny stamp scuff at top, Fine. 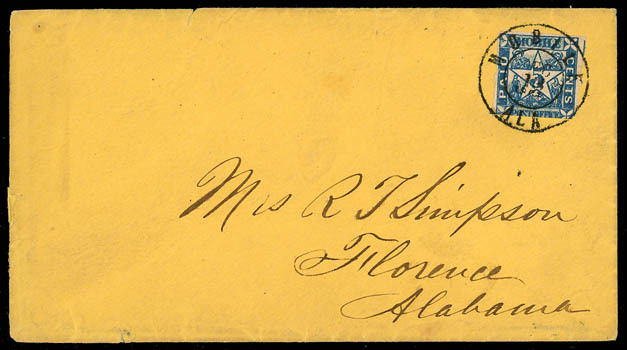 Confederacy, Mobile, Ala., 1861, 5¢ blue, large margins to in at bottom including part of adjacent stamp at right, detailed impression on crisp paper, tied by sharp "Mobile Ala., Dec 13, 1861" double-circle datestamp on orange cover to Florence Ala.; missing part of top flap and minor edge tears, F.-V.F., ex-Steinmetz. 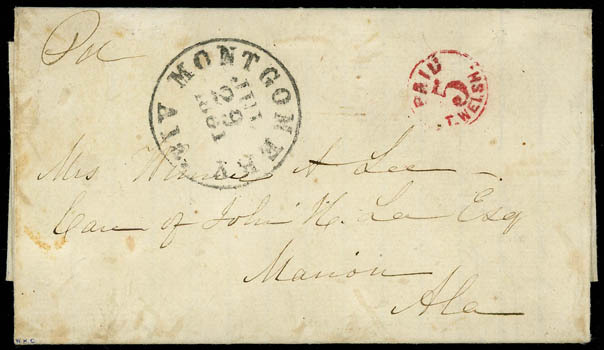 Confederacy, Montgomery, Ala., 1861, 5¢ red, clear strike of circular provisional handstamp on folded letter to Marion, Ala., "Montgomery, Ala., Jul 29 1861" cds, letter regarding the wounding of soldier in Sherman's battery during the first battle of Bull Run…How proud will we be of his wounds! We will glory in his being crippled in defense of his country…My brother Louis regiment was in the fight but he was not hurt he was in the center under General Davis, Very Fine. 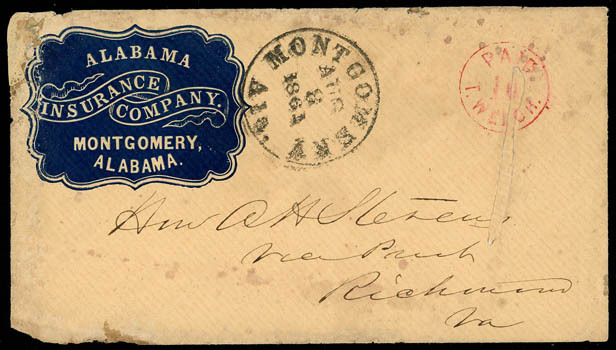 Confederacy, Montgomery, Ala., 1861, 10¢ red, fine strike of provisional handstamp on buff cover with blue "Alabama Insurance Company, Montgomery" fancy cameo, cancelled by "Montgomery Ala. Aug 8 1861" cds and addressed to Hon. A.H. Stephens, Vice President, Richmond Va., usual docketing on reverse indicating "E.H. Metcalf, Montgomery, Ala, Aug 7th 1861, Wished his son William now at Norfolk permanently attached to the Engineer Corps of the Army and request Mr. S. to lend his influence in futherance of his wish"; cover mend into provisional handstamp and upper left corner, Fine, an exceptionally rare Montgomery 10¢ red entire with a cameo corner card. 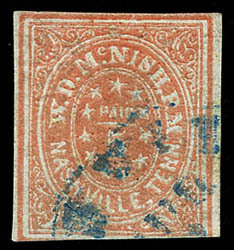 Confederacy, Nashville, Tenn., 1861, 5¢ brick red, blue Nashville town cancel, margins ample to in at bottom, upper left corner crease and tiny filled thins, Fine appearance, ex-Wishnietsky. Confederacy, Nashville, Tenn., 1861, 5¢ violet brown, tied by blue "Nashville, Ten." 1861 cds on cover to S.H. 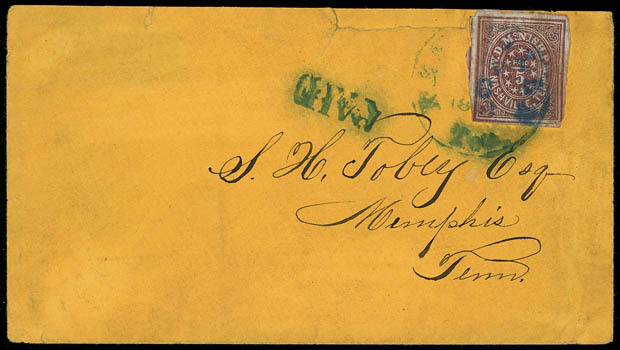 Tobey Esq in, Memphis Tenn., with matching blue "PAID" straightline; top edge mended and flap faults, Fine, a rare usage, ex-Seybold. 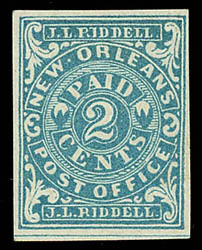 Confederacy, New Orleans, La., 1861, 2¢ blue, large margins, beautiful color on bright paper, o.g., small hinge remnant, fresh and Extremely Fine; with 1991 P.F. and 2004 C.S.A. certificates. 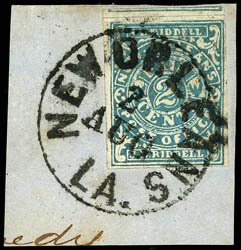 Confederacy, New Orleans, La., 1861, 2¢ blue, Position 34, large margins including part of adjoining stamp at top, bright shade, tied by bold "New Orleans La., 2 Aug" cds on small blue piece, Very Fine and choice, ex-Ashbrook and Skinner.